It’s always exciting moving into a new home. So I am delighted that Ottawa Magazine has invited me in, and given me the opportunity to soldier on in my gluttony, hosting a regular dinner column in this space. My plan is to carry on providing my Monday lunch suggestions on places that are fuelling our mid-day needs. The only difference is that these will now be sandwiched between longer restaurant reviews. Today’s column takes us to a three-year-old place that’s seen a few big changes in its kitchen since opening days (when I last brought a pen to its table) and thus seemed in need of another look. Back Lane Café is run by a local legend of a restaurateur. George Monsour’s earliest restaurants in Ottawa — the five Ritz restaurants — filled the pages of some of my earliest reviews. That’s going back some twenty five years. For those who knew the influence of Monsour on Ottawa’s emerging dining out scene, it was noteworthy when he returned to the business after a number of years away. He took a gamble on a neighbourhood flirting with gentrification and conjured, in the thoughtful renovations of a little Ethiopian restaurant, a bit of European farmhouse magic borrowed from many sources. I liked Back Lane from the get-go. The food was honest and flavourful. Service was welcoming, attentive, and knew its business. The room itself had a beguilingly rumpled sophistication about it. The space was almost clubby, handsomely cluttered with well curated details. Lots of good things to look at. And though it was brand new, the materials used had a patina and the kind of character that gave Back Lane roots as thick as its barnyard beams. As it enters its fourth year, restaurant chefs have come and gone. Opening chef was Evan Pritchard. Next came Michael Hay who had left behind his molecular cooking at The Courtyard Restaurant for these wood fired ovens in 2012. Under his leadership, the cooking remained rustic Mediterranean, but the food edged more toward fine dining. But Hay left a few months later to pursue other projects, eventually landing in Toronto, and for a while the Back Lane kitchen seemed a bit rudderless. Shrimp with hummus and butter beans. Photo by Anne DesBrisay. News that a former cook from ZaZaZa had taken over didn’t make my heart go pitter patter. But I was interested to learn that Phil Denny, whose cooking at Jak’s Kitchen I had long admired, had crossed the street from the Elmdale Oyster House (where he had landed most recently), to team up with new restaurant chef Connor McQuay (who, I learned, had also worked in the National Arts Centre). I thought before anything else changed, I’d better get over there. I parked myself in a corner for my final taste, the better to watch the eclectic crowd, and turned my attention to the short dinner menu. Six starters, six mains, five wood fired pizza options. Nothing new in that formula. Some dishes were old favourites from early days — the Fisherman’s Stew, say — but when I asked what the latest dishes were, I was steered toward shrimp and lamb. 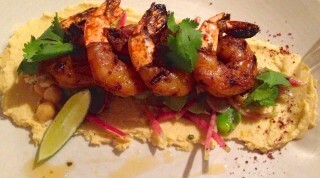 The first was a pretty good dish, the shrimp meat crunchy-sweet and flavourful. There were five of them sitting pretty on a bed of hummus, where the grill flavours mingled with the brightness of lemon and sumac, the chestnut aroma of the garbanzo beans and the gentle warmth of chiles. Tossed in were butter beans, which added more legumey-meatiness. Some crisp relief came with the pretty watermelon radish that had been shredded like mottled pink matches with pale green tips, and tossed in lime. The excellent house bread wiped up the last bits of grill-juice and hummus. 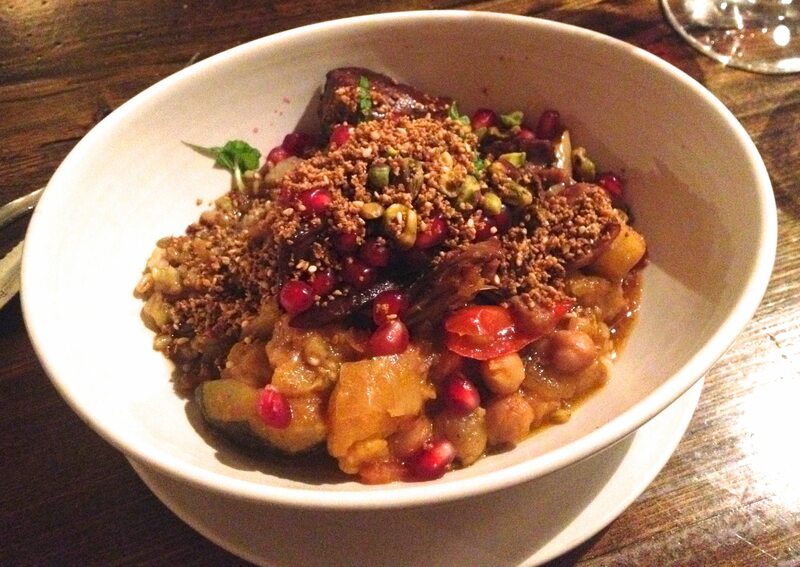 Slow braised lamb shank served with freekeh, roasted eggplant, red peppers, pomegranate, nuts, and seeds. Photo by Anne DesBrisay. But the money dish was the lamb. Yes, 2014 is young, so telling you it was the best thing I’ve tasted all year isn’t saying much. But it was an impeccably judged plate of food, precisely what you want to be eating on a brutally cold January night, and ten days later I continue to think about it. This was a slow braised lamb shank, incredibly tender and wickedly rich, the meat removed from the bone and mingling with mates that elevated it. It came on a bed of perfectly chewy freekeh (cracked green wheat, a mainstay in Middle Eastern cooking and generally hard to find here) with smokey, juicy chunks of roasted eggplant and soft, sweet red peppers, toasted pistachio nuts, marinated apricots, dried figs, and charming bursts of juicy pomegranate seeds. It all danced so well. I didn’t want it to end. So I brought it home and had the balance for breakfast. The wine list, like the food list, is small but well chosen and includes some expensive treats (in the $100-$175 range) for those in a mood to splurge. George Monsour’s Back Lane Café remains a really good place to eat. 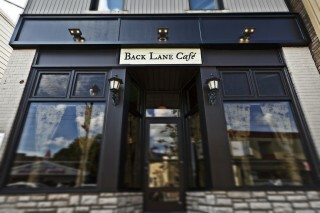 Back Lane Café. 1087 Wellington St. W., 613-695-2999.